Lissagriffin (the fort of Griffin) lies on the south-facing slope on the northern side of the salt marshes behind Barley Cove. It is a sunny spot with panoramic views back to the hills beyond Goleen and across the salt marshes below to the dunes of Barley Cove and the sea beyond. Nowadays, it’s a peaceful place of farms and pasture land, but there are clues in the landscape and the old maps and records that there was much more going on here in times past. The most visible reminder is the ruined church, surrounded by a graveyard. Once, these lands were in the possession of the Rev Fisher – remember him from my Saints and Soupers saga? They were associated with the Glebe Lands accruing to the Church of Ireland, which means that the rector was also the administrator of the graveyard, to whom you had to apply for permission for burial. The church and graveyard is known as Kilmoe (pronounced kill moo, meaning the the church of Muadh, although I haven’t been able to identify this saint), like the parish of the same name which occupies most of the Mizen west of Schull. The graveyard has headstones going back to the 1700s, although I couldn’t find any from that era on my searches. All the local names are represented here, including the Burchills and the Wilkinsons of my Cousins Find Each Other post. It was in use as a burial plot during the Famine – a memorial plaque on the wall attests to this. A feature of graveyards from this time was a watch-house, a reminder that bodysnatching was a lucrative trade. During the famine watch-houses also enabled people to be on the look out for dogs – there are accounts of dogs attempting to get at bodies barely covered by soil during this terrible time. There’s a ruined structure just inside the gate at Kilmoe (below), probably a watch-house from this time. Like all historic graveyards around here there are many plots marked by simple stones, headstones and foot-stones, where people could not afford the services of an engraver. Remarkably, the knowledge of who is buried in some of those unmarked graves still resides somewhere, whether in church records or in the folk memory of local people. You can browse the listings of the graves here. There are hints in the structure of the Romanesque style, which would place it in the 12th century. The east window is clearly Romanesque in construction, while the door, with its plain lintel and ‘relieving arch’ also appears so. I am seeking some confirmation of this and will update this post if or when I get a response. The west end appears to have been two storey – the joist supports are still projecting from the wall, which means that the old ground level was lower than it is today and that the window was in the second storey. That window (below) is ogee-headed – a clearly gothic element, which means (if I am right about the west end) that it was inserted later. The whole church may have been modified many times over the years it was in use. There is a record of a cross-inscribed stone inside the church – we have looked for this but cannot find it. It may be gone, or it may be partially buried in the long grass. There’s no sign of the vicaridge house joining to ye church-yard. But the landscape around has other elements too – or rather had other elements. There used to be an O’Mahony Castle just to the east of the church, of which no trace remains today. We know of it from Griffiths map of the 1840’s, (below: apologies for the blurriness, it seems to be the best resolution one can get) where it is clearly marked as a ruin. While many of the O’Mahony castles were closer to the shore, this one would have benefited from all-encompassing views of both land and sea, and from proximity to the church, for worship. According to James Healy’s The Castles of County Cork, it was probably tenanted by the O’Meighans, a bardic family associated with the O’Mahony clan. Although there is nothing left, local people told Healy in the 1980s that the site was cursed and that bad luck attached to it. Even older still are the numerous standing stones that dot the hillside to the east and north. The photograph below shows one – a rather stumpy example. And probably even older than those are the cupmarks reported on the rock face just to the east of the graveyard. We have searched for these too, but were defeated by the gorse and brambles. Of unknown vintage is the bullaun across from the graveyard gate. Although bullauns are often carved in free-standing boulders, this one was scooped out of the bedrock: it is known locally as a wart well. Dip your finger in, say the requisite prayers, and your wart will disappear. We even found a small bottle for Lourdes holy water left by it on one of our visits, showing that it is believed to still possess curative powers. Robert agrees! Amanda has included it in her Holy Wells blog. Next time you’re headed out to Barley Cove on a fine day, take a little detour up to Lissagriffin church. The views alone are worth it, although a little wander around the graveyard will do a lot to soothe your soul. What were your favourite Roaringwater Journal blog posts of 2014? Our blogging software provides a running count of visitors to Roaringwater Journal and it’s always fascinating to see which ones receive the most views. Some of them are our own favourites as well, and some can attribute their high numbers to being re-blogged by others, or to being shared on social media. So tell us, Dear Reader – did the software capture it – or do you have a different favourite from our top posts of 2014? The top two posts of 2014 were the ones we wrote about our trips to Cape Clear and to Whiddy Islands. We loved our time on the islands and intend to go back often – our enthusiasm probably shone through. But it may also be that islands hold a mystique for us that is hard to define – out there in the dawn mist, mysterious and peaceful, whole worlds unto themselves. The islanders of West Cork are worried at the moment by cuts to their development officer funding, and need all the support we can give them. So if you live here, or are planning a trip, include one or more of these beautiful islands in your plans. Next in popularity was our post on the Timoleague Friary. 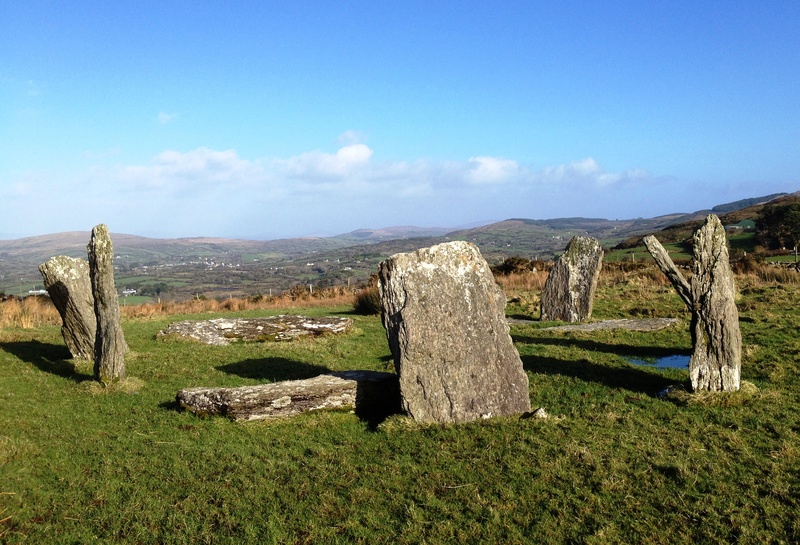 It’s an iconic piece of West Cork history and architecture – the only sizeable medieval religious ruins we have, perched on a picturesque estuary of the Arigideen River. Finola’s frustration at the inflexible regulations that treated her like a novice driver, despite forty years of driving experience, must have struck a chord with you. Maybe you dropped by Driving Home the Point to sympathise with her plight, or maybe it was to chuckle over the numerous example of the routine flouting of the Irish rules of the road, or the bemusing driving conditions of many rural roads. We have enormous nostalgia for the things we remember from our childhood, don’t we? In that vein, it’s not surprising that Shopping for Memories was such a popular post. These lovely old shops evoke a time when a whole variety of shops lined the main streets and our mothers went from the butchers to the greengrocers to the chemists to the haberdashers and, if we were lucky, to the sweet shop on a daily basis. But sadly, the numbers of these old-fashioned shops are dwindling. This year we said goodbye to Wiseman’s in Durrus, no longer able to compete against the hardware shops of Bantry. Fortunately, their wonderful Carraig Abhainn Gardens are still open behind the shop – and our description of this hidden gem was one of your favourite posts of the year. A group of posts on festivals came next. We wrote about the question our friends asked us when we decided to move here, What on earth will you find to DO? We answered in a series of posts describing some of the local events and festivals we have taken in this year – the Ballydehob Jazz Festival and Arts and Culture Festival (which included our own Rock Art Exhibition), traditional music Festivals in Baltimore, Bantry and Ballydehob, and a host of musical and theatrical events. One day all of you retirees out there are going to discover that moving to West Cork is the best decision you can make! 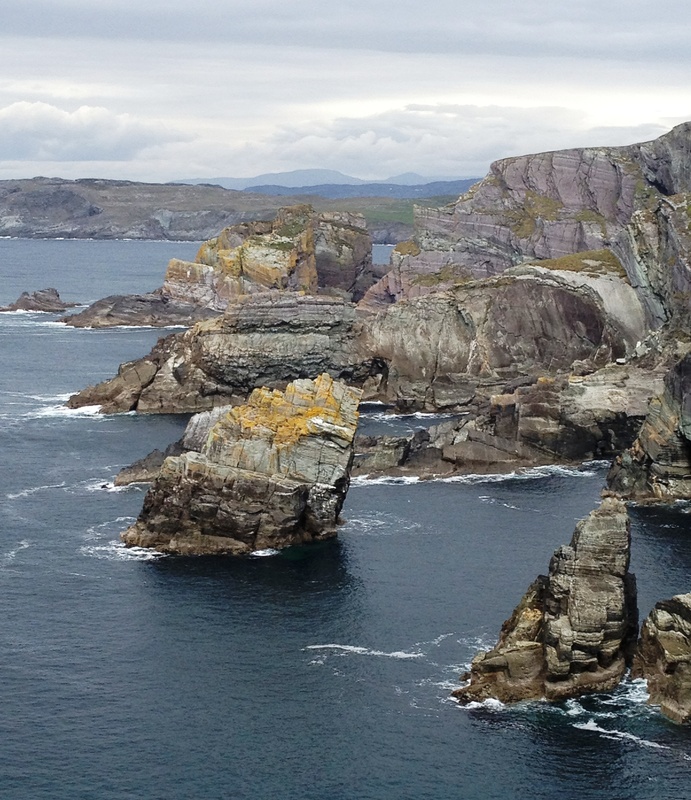 The next group of posts centred on the Mizen – the Mizen Magic posts where we concentrated on aspects of the Mizen Peninsula that delight us – the Beaches, Brow Head, the Butter Road, Mount Gabriel, the Gortnagrough Folk Museum, and the history and archaeology of this beautiful part of Ireland. In fairness, like, it looks like ye would have enjoyed our take on how to speak like ye’re from West Cork. Those little posteens made you happy out. Ye must be a fierce active crowd altogether because you really got a kick out of Finola’s description of her day of sailing and (perhaps her personal favourite in the activities department) her moonlight kayaking on Lough Hyne. Happy New Year from Robert and Finola! And our own personal favourite of 2014? Robert’s post on the Sky Garden, of course! If you haven’t read it yet, you’ll have to do so to find out why this was the highlight of our year in West Cork. A little further east of us there are good surfing beaches but here on the Mizen our beaches feature the golden sand and the dunes of the classic swimming beaches. The most popular with holiday-makers is the incredible expanse at Barley Cove. These photos were taken in February – so we aren’t swimming, but we have the place almost to ourselves, apart from the horses, and we are loving it! Around the corner from Barley Cove are the beaches of Galley Cove and the White Strand. When the sun goes down on one, you can just move to the next one. A local favourite is the beach at Ballyrisode, near Toormore. We strolled along it on a fine day in September, with nary another soul in sight. But of course we have our own little secret beach nearby. Those in the know call it Shelly Beach – for the reasons you might imagine. You can’t drive there – it’s only accessible on foot down boreens and over the fields – and it’s a beautiful, peaceful spot, perfect for that wind-in-the-hair, sun-in-the-face, contemplative experience. The last photo wasn’t taken on the Mizen, but it’s only a few miles to the east, so perhaps it’s not totally cheating to include it here. It was taken on a fabulous sunny day half way through October, and the beach was alive with activity. Contrary to popular belief, Mizen Head is not the most southerly point on the Irish mainland – that distinction actually belongs to Brow Head, just to the east. Brow Head doesn’t have the same profile as Mizen Head: many people have never heard of it. But it’s magnificent, steeped in history, wonderfully scenic and best of all, totally walkable. You arrive at Brow Head by driving west from Schull out towards Crookhaven. If the water is low in the Haven you may spy the remains of ancient field boundaries, covered at high tide. The starting point is Galley Cove – a smaller and quieter beach than the popular Barley Cove a little further west, but featuring the same white sand and inviting Caribbean-blue water. You can leave the car here and proceed on foot uphill if you’re feeling in the need of an aerobic workout. Or you can drive up the narrow road, but be warned: if you meet a car coming down you may have to reverse a considerable distance. There is parking for three or four cars at the top of the hill. The first thing you’ll notice, in front of the lone house at the top of the hill, is an impressive row of standing stones, aligned to point back down the Mizen Peninsula. These are recent additions to the landscape, testament to the enduring tradition of erecting such stones in this part of the world. 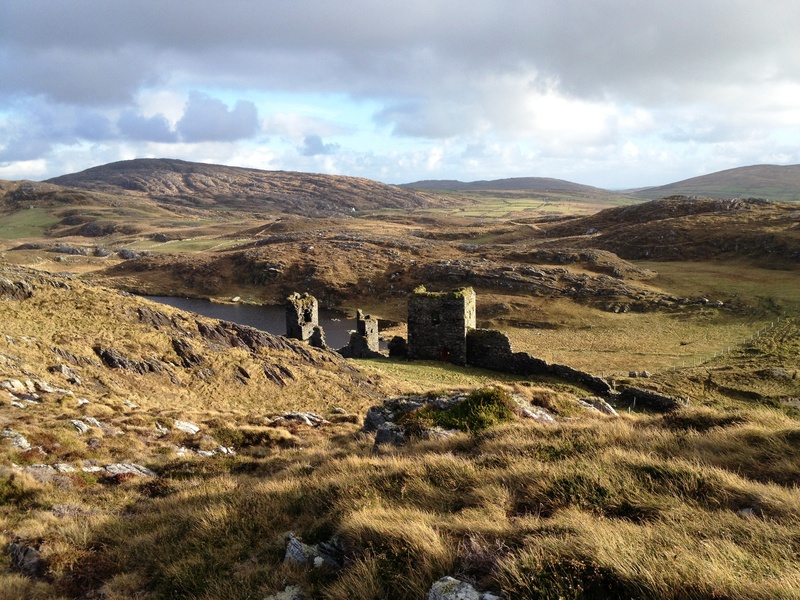 Scramble up through the heather to the remains of the Napoleonic-era signal tower and the Marconi Telegraph Station – see Robert’s post for more about Marconi and early wireless telegraph in West Cork. From here there are panoramic views east to Crookhaven and down the Mizen Peninsula, west to Mizen Head, North to Barley Cove and southeast to the Fastnet Rock. Follow the path now south west to the tip of the Head. This was a copper mining area in the nineteenth Century and you can still see the ruins of the Mine Captain’s house, miners’ dwellings and fenced off mine shafts. Abandoned cottages litter the north-facing slopes, with small overgrown fields defined by stone walls. Near the tip of the Head you must cross a narrow causeway with steep cliffs on either side. This part is not for the faint of heart (or small children, perhaps) especially on a windy day. Find a sheltered spot at the end and sit a while. You may see gannets diving here, or dolphins in the waters below, and you will certainly be aware of the power of the pounding waves. Before you leave, make sure that you make a wish – after all, this is a special place, and special places in Ireland have their own magic. We’ve done several posts on the Sheep’s Head and the marked hiking trails that crisscross that peninsula. But we actually live on a different peninsula, The Mizen, and it is just as glorious and wild and beautiful. The road to the Mizen Head starts at Ballydehob, runs along the southern side of the peninsula through Schull and Toormore and on to Goleen and Crookhaven. 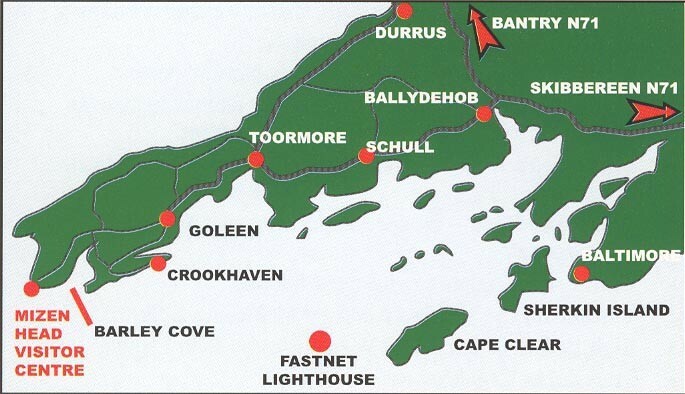 At the far or western end are the beaches of Barley Cove and the Mizen Head Lighthouse and Visitor Centre. There are no villages on the northern side of the peninsula until you reach Durrus, which also marks the start of the Sheep’s Head Peninsula. 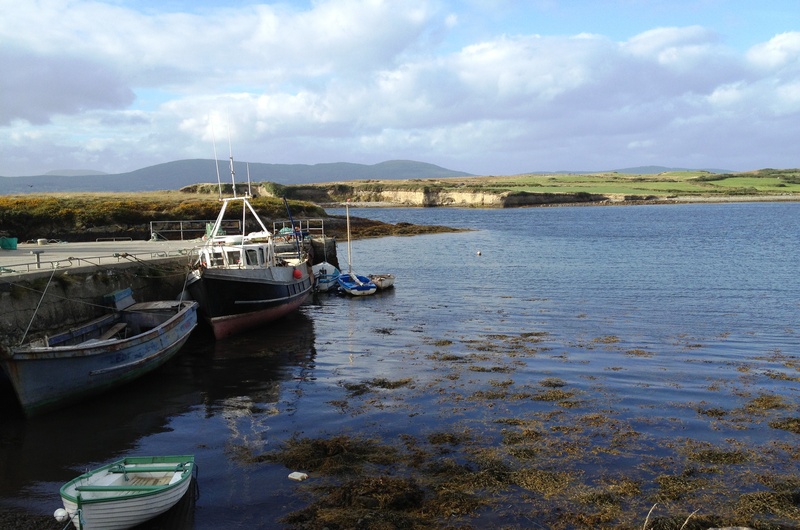 It is bounded on the south by the waters and islands of Roaringwater Bay and on the north by Dunmanus Bay. The whole peninsula is rich in history and archaeology and we plan future posts about many aspects of life here. 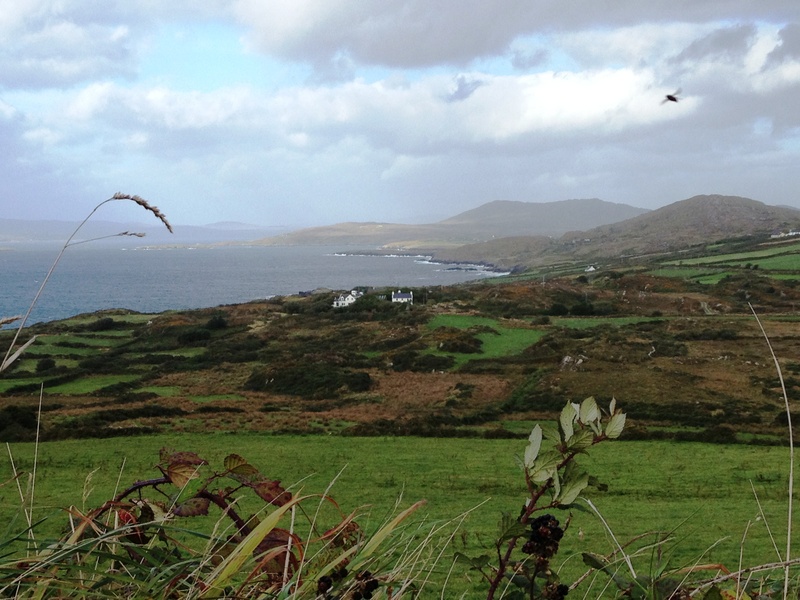 For the moment, a flavour in photographs of what The Mizen landscape has in store for visitors.